We carry primitive and lace curtains. Whether you are looking for valances, tiers, swags or panels you will find them here. Our country or lace style curtains come in a wide range of colors or shades. The colors that you choose will match with a valance and a swag. Or if you want you could combine a valance, swag and tiers at one window in the same country, lace or primitive color. Everyone has their own personal style whether it be country, primitive or lace you will find it here. I don’t know about you, but for me, home is a special place where I can softly land every night. Where I spend my days doing the things I love to do, whether it be gardening or cooking a fantastic meal … maybe it is just time for lounging … although, sometimes it doesn’t feel like there is enough time for that! So my home needs to be my own style. Everyone has their own personal décor style that needs to please them. A home should make you feel good … should give off a good energy … no matter what décor style it is - as long as you find comfort there. Welcome to our Web site! We specialize in primitive country and lace curtains. You will find Park Design and Heritage Lace curtains on our site. Whether you are looking for the primitive prairie gathered swags or country style you will find them here. Heritage Lace Curtains are made in the USA and are very beautiful. We carry primitive curtains, burlap or burlap with stars. You may be looking for lodge style or primitive with bear or moose. 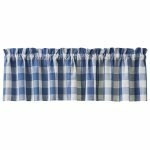 Our plaid primitive curtains will remind you of homespun. There are many colors that you will find that will go with different decors. We keep our shipping at a flat rate to keep costs down for our customers. So come on in and check us out!!! !